On January 31, 2014, the LDS Church published an essay entitled “Book of Mormon and DNA Studies” in the Gospel Topics series on its official website, LDS.org. In this article, we will provide some background on this issue focusing on the Book of Mormon itself, followed by a point by point response to various statements made in the LDS.org essay about the Book of Mormon. In a companion article, we take a closer look at the science, responding in detail to what the LDS.org essay says about genetics in relation to the Book of Mormon. The Book of Mormon presents itself as an historical narrative concerning two successive civilizations in the Americas stretching back more than two thousand years before Christ. The DNA controversy with regard to the Book of Mormon concerns correlating its historical claims about the peoples of its narrative with the genetic evidence concerning the origins and history of the Native American peoples prior to the arrival of the Europeans in the fifteenth and sixteenth centuries AD. The end of the Jaredite civilization is clearly indicated by the Book of Mormon narrative as taking place in the early sixth century BC, since it records that the people of Zarahemla (whom Mormons commonly call Mulekites) met Coriantumr, the last surviving Jaredite, soon after their arrival in the New World (Omni 1:21-22). Despite this information, LDS scholars often argue that some remnants of the Jaredite people may have continued for a few hundred years more. In any case, according to the Book of Mormon Jared and his brother led a group of people away from the Tower of Babel, left the Middle East, journeyed across the continent and an ocean, and settled in the Americas, all within the lifetime of Jared and his family (Ether 1–6). They then multiplied, established a dynastic kingdom, built cities, fought wars, and finally exterminated one another. The problem here is that the scientific consensus is that the Americas were first populated roughly 15,000 years ago by people from Siberia who had gradually made their way to Beringia (a land bridge where the Bering Strait is now located) and eventually crossed over into Alaska and from there spread southward throughout the Western Hemisphere. The problem here is fourfold and involves the who, where, when, and why of the migration. According to the Book of Mormon, the original inhabitants of the Americas were (who) a Middle Eastern people that (where) traveled a long distance over land and sailed across an entire ocean (when) roughly 4,000 to 5,000 years ago within a single generation (why) as part of the scattering of people at the Tower of Babel. According to mainstream scientists, the original inhabitants of the Americas were (who) an East Asian people in Siberia that (where) traveled across a land bridge connecting Siberia to Alaska (when) roughly 15,000 years ago over a period of centuries (why) as part of a natural pattern of migration as hunters and gatherers sought for food under changing climactic conditions. They represent the first generation of human beings to travel there from Babel (Ether 1:33-43). The Book of Mormon presupposes the traditional understanding of Genesis that all human beings were living in the region in and around the Middle East at the time of the tower (Ether 1:33). Even before the Jaredites reach the New World, they travel through a wilderness “where there never had man been” (2:5). The Jaredites are the specific “people” or “nation” whom the Lord granted to “possess” the land of promise (Ether 2:8-12). The Book of Ether narrative tells about the Jaredites reaching “the promised land,” spreading out on the land, multiplying, farming, taking a census of their people, and creating their own kingdom, all without any mention of any indigenous people with whom the Jaredites might have come into contact (see Ether 6:12-29). Note that this is not simply an argument from silence, but part of a larger picture of a people living in the land on their own. When the Lord judged the Jaredites by bringing on them “utter destruction,” the land would not simply remain populated by other people already there; instead, “the Lord God would send or bring forth another people to possess the land, by his power, after the manner by which he brought their fathers” (11:20-21, emphasis added). The last clause of Ether 11:21, “after the manner by which he brought their fathers,” clearly means that the people who would possess the land after the Jaredites were to arrive there by transoceanic journey just as the Jaredites had. These five lines of evidence from within the text of the Book of Mormon are sufficient to conclude that the Jaredites are represented as the only inhabitants of the land (to whatever extent that land might have been) in which they existed for roughly two thousand years. If this interpretation of the Book of Mormon is correct, as it seems rather clearly to be, then the Book of Mormon account of the Jaredites stands in sharp contradiction to the scientific consensus (which Mormon scholars do not dispute) that the Americas had been inhabited continuously for about ten thousand years before the Jaredites arrived. Even if we suppose that the Book of Mormon allows for an established, much larger population in the Americas prior to the arrival of the Jaredites, there is still a serious problem. Minimally, the Jaredites are represented as a significant people in their land who built a civilization lasting for roughly two thousand years and numbering in the millions. If they were people who had migrated from the Middle East roughly 4,000 to 5,000 years ago and then lived for two millennia among other tribes or peoples who came from Siberia and are the main ancestors of today’s Native Americans, one would expect that the Jaredites would have contributed Middle Eastern genetic markers into the Native American population. However, no such markers have been found in modern Native American people or in the remains of ancient Native Americans that have been tested throughout the hemisphere. The main story line of the Book of Mormon concerns two groups of Israelites who left Jerusalem and sailed across the ocean to the Americas in the early sixth century BC, around the time that the Babylonian Empire took control of Jerusalem and then destroyed its temple (587/586 BC). One of these groups consisted mainly of the family of Lehi and another family with whose daughters Lehi’s sons married before their transoceanic voyage. This group, which we may designate the Lehites, divided into two peoples named for two of his sons, Nephi (the Nephites) and Laman (the Lamanites). The second group was led by Mulek, a son of the deposed Davidic king Zedekiah. These “Mulekites,” designated “the people of Zarahemla” in the Book of Mormon, lived in the land unaware of the Lehites for about four centuries, when they were united with the Nephites (Omni 1:14-19; Mosiah 1:10; 25:2-5, 13). After a period of peace and unity during the first two centuries AD, the Nephite people became increasingly corrupt and a resurgent Lamanite population eventually wiped out the Nephites in the early fifth century. The surviving Lamanites, a savage warrior race, remained—and was in the land when the Europeans arrived over fifteen centuries later. As explained in the discussion above concerning the Jaredites, the Book of Mormon represents the land to which all these peoples journeyed as a “land of promise” that had been occupied and possessed by the Jaredites until they massacred one another about the beginning of the sixth century bc, with only one Jaredite surviving when the new settlers arrived from Jerusalem. The story of the Jaredites thus establishes a context in which the reader is given to understand that the land was uninhabited when the Lehites and the Mukelites arrived. This understanding is confirmed very early in the Book of Mormon. Nephi, the heroic leader of the Lehite party, is told that God has “prepared” this land for his people (1 Ne. 2:20) and anticipates that they will not merely dwell in the land but will “obtain” it (7:13). When Lehi and his party arrive in the “promised land,” they occupy the land, begin planting crops, and find game for hunting, animals suitable for domestication, and all kinds of precious metals (18:23-25)—but apparently they did not find other people. The land was “choice above all other lands” and was “covenanted” by the Lord to Lehi for his descendants and for others—not others already living there, but others “who should be led out of other countries by the hand of the Lord” (2 Ne. 1:5). It was God’s wise intention “that this land should be kept as yet from the knowledge of other nations; for behold, many nations would overrun the land, that there would be no place for an inheritance” (1:8). If Lehi’s descendants remained righteous, God promised that they would “be kept from all other nations, that they may possess this land unto themselves” (1:9). This passage in 2 Nephi 1 is especially clear on the matter: the Israelites who had arrived in the land of promise were to possess it to the exclusion of all other nations, whom God would keep from even knowing about the land, unless the Israelites became wicked. Thus the Israelites who occupied the land were to be the only people living there unless they turned their backs on God. This was the traditional view among Mormons for most of LDS Church history. For the past thirty years or so, Book of Mormon scholars have generally recognized that the traditional view that the Nephites and the Lamanites were the only peoples or nations in the land simply cannot be defended as historically, anthropologically, or culturally plausible. In order to resolve various problems for the historical credibility of the Book of Mormon, LDS scholars argue that the Lehites and Mulekites lived in a small area within ancient Mesoamerica (basically Guatelama and parts of southern Mexico) and that even there they were only a small subset of a larger population. These scholars came to this conclusion prior to the developments in genetics in the last decade of the twentieth century that proved that Native American peoples are Asiatic, not Middle Eastern, in origin. However, the DNA problem appears to have been a factor in making such “limited geography” positions more appealing to rank and file Mormons. In order to defend the view that the Israelite peoples of the Book of Mormon were only a small subset of a larger population in their lands, LDS scholars have worked hard to show that the Book of Mormon contains hints of the existence of other peoples or nations in the land when the Israelites arrived in the sixth century BC. Hints are all that might potentially be found since, as Mormons generally admit, the Book of Mormon never actually mentions non-Israelite peoples living among the Nephites, Lamanites, or Mulekites. LDS anthropologist Brant Gardner, in his six-volume commentary on the Book of Mormon, has admitted, “All evidence for people already living in the ‘land of promise’ comes from inference, not direct evidence.”3 No such inferences are necessary when reading the Bible, which is full of references to Egyptians, Canaanites, Assyrians, Babylonians, Greeks, Romans, and other non-Israelite peoples. By contrast, the Book of Mormon contains no references (by any names) to the Olmecs, the Mayans, or any other such peoples. 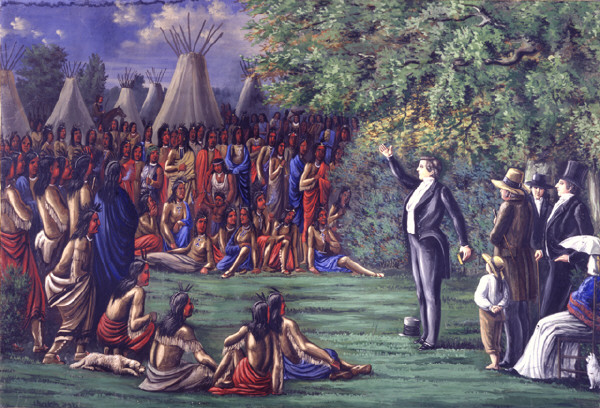 A further difficulty for any attempt to limit the Israelite presence in the Book of Mormon lands in the Americas is the fact that Joseph Smith, and most of the LDS prophets who succeeded him, taught that the American Indians—and others—were Lamanites, literally descended from Lehi and the other Israelites who had settled in the New World in the sixth century BC. Joseph Smith frequently referred to the American Indians as Lamanites, notably in numerous “revelations” he claimed to receive commissioning LDS Church members to establish themselves in predominantly Indian regions in order to preach to the Lamanites (D&C 3:16-20; 10:48; 19:26-27; 28:1, 8-9, 14; 30:6; 32:1-2; 54:2, 8; 57:4). In the book Joseph Smith–History, considered LDS scripture, Joseph states that an angel of God told him that the Book of Mormon gave “an account of the former inhabitants of this continent, and the source from whence they sprang” (JS-H 1:34, emphasis added). Based on the Book of Mormon and Joseph Smith’s own teaching, the traditional view of the LDS Church has been that the Lamanites encompass all of the Native American peoples of the Western Hemisphere (and even, according to popular belief, many of the peoples of the Pacific islands).7 This view necessarily entails that Native Americans are predominantly Middle Eastern in origin. However, the evidence of modern genetics shows that Native Americans have no significant genetic links to any Middle Eastern peoples. The problem is compounded further when we remember that the Jaredites, whom the Book of Mormon says occupied the same lands prior to the arrival of the Lehites and Mulekites, were also supposed to have been of Middle Eastern origin. The consistent finding of modern genetic study that all Native American peoples descended from Siberian or East Asian ancestors who came into the hemisphere through Alaska millennia before the Jaredites would have existed thus poses an extremely serious problem for the historical validity of the Book of Mormon. In the rest of this article, we will comment on specific statements in the LDS.org essay “Book of Mormon and DNA Studies” pertaining to what the Book of Mormon says about the peoples living in the Americas. Quotations from the essay will appear as separate paragraphs in italics, followed by a response. Nothing is known about the DNA of Book of Mormon peoples…. One reason it is difficult to use DNA evidence to draw definite conclusions about Book of Mormon peoples is that nothing is known about the DNA that Lehi, Sariah, Ishmael, and others brought to the Americas…. It is possible that each member of the emigrating parties described in the Book of Mormon had DNA typical of the Near East, but it is likewise possible that some of them carried DNA more typical of other regions. The claim that we know nothing about the DNA of Lehi and his party (assuming they existed at all) seems disingenuous. Obviously, we cannot know what their DNA would be like in complete specificity, but we can reasonably assume that they would be fairly typical of Middle Eastern persons living 2,600 years ago. Lehi and Ishmael are said to have been members of two of the tribes of Israel, and Lehi’s sons, including Nephi, are said to have married Ishmael’s daughters. Although we are not told anything about the parentage or family line of Sariah or Ishmael’s wife, the presumption that they were of Near Eastern (or Middle Eastern) heritage is obviously a safe assumption. Indeed, people in the ancient world almost always married persons of the same tribe (usually of the same village or town), or at least of the same nation. Likewise, Mulek is said to have been a son of Zedekiah, in the Davidic line, and it is reasonable to infer that most or all of the people who traveled with him were Jews. The essay suggests that it is just as “possible” that members of these two groups were not of typical Middle Eastern descent as that they were. This suggestion does not appear to be reasonable. It would have been more accurate to have said that while it is barely possible that one or more members of these groups were not of typical Middle Eastern lineage, it is highly probable that most or all of them were. Geneticists can study the genetic history of populations using different methods, and the results of these methods can be compared as independent means of confirming any conclusions that are drawn. Mitochondrial DNA testing traces genetic history through mothers, whereas Y chromosome testing traces genetic history through fathers. Thus, even though we are not informed of the lineage of Sariah and of Ishmael’s wife, or of Mulek’s wife, we have sufficient information about the men to establish a reasonable presumption that the offspring of these founders would retain evidence of their Middle Eastern genetic heritage. Much of the argumentation of the LDS.org essay, and of other Mormon apologetic literature on DNA and the Book of Mormon, plays up the fact that one type of test is not definitive while ignoring the possibility of using both types of test in studying the genetic history of populations. To say that “the Book of Mormon provides little direct information about” other peoples with whom the Book of Mormon peoples might have interacted is yet another misleading statement. In actuality, the Book of Mormon provides no direct information whatsoever about other such peoples. There are literally thousands of references to non-Israelite peoples in the Old Testament, but no such references at all to non-Jaredite or non-Israelite peoples in their lands anywhere in the Book of Mormon. Moreover, as discussed earlier in this article, the Book of Mormon explicitly denies the presence of other peoples in the “land of promise” besides the Jaredites followed by the Lehites and the Mulekites. The Book of Ether states that the Jaredites were the first generation of human beings to travel to the New World from Babel (Ether 1:33-43) and that it was a land that “the Lord God had preserved for a righteous people” where they would be “free…from all other nations under heaven” (Ether 2:7-12). Nephi, the de facto leader of the Lehite party, is told that God had “prepared” this land specifically for them (1 Ne. 2:20; 7:13; 2 Ne. 1:5-9) until the future arrival of other nations, referring to the Europeans who came to colonize the Americas roughly a thousand years after the end of the Nephite civilization. The Book of Mormon itself, however, does not claim that the peoples it describes were either the predominant or the exclusive inhabitants of the lands they occupied. In fact, cultural and demographic clues in its text hint at the presence of other groups. As explained above, the Book of Mormon most certainly does claim that first the Jaredites, then the Israelites (Lehites and Mulekites), were the exclusive people groups or nations inhabiting the lands they occupied. It is now standard in LDS scholarship to claim that the Lehites and Mulekites were an extremely small contingent of people overwhelmed numerically by the indigenous peoples who were already in the land when the Israelite groups arrived. The Book of Mormon narrative may be said at most to allow for the reverse of what Mormon apologists envision: that the Lehites and Mulekites were the dominant peoples of the land and that anyone else who showed up was dwarfed numerically and culturally by the Israelite peoples. The Book of Mormon is quite clear: the lands in which the Lehites and Mulekites lived were their lands (see, for example, Alma 54:13-14; Mormon 5:4) and would remain such until the Gentile nations (the Europeans) arrived long after the disintegration of the God-honoring Nephite civilization. Because the Book of Mormon does not mention any non-Israelite peoples living in the New World during the millennium of the Nephites, LDS scholars have resorted to scouring the text looking for what the LDS.org essay calls “cultural and demographic clues” that “hint at the presence of other groups.” Many of the arguments for these hints presuppose that the Book of Mormon is an historical record, which is what needs to be shown. Such supposed hints in the text do not overcome the explicit statements of the Book of Mormon that the lands occupied by the Nephites and the Lamanites were reserved for them during that period. Joseph Smith appears to have been open to the idea of migrations other than those described in the Book of Mormon…. As noted earlier, Joseph Smith explicitly claimed in statements found in the LDS scriptures that the Book of Mormon was an account of the origins and history of the American Indians. Whatever else he might have said or allowed, his official, supposedly inspired revelations on the subject should be the point of departure for any believing Mormon as well as for anyone interested in knowing what the Book of Mormon was originally understood to say. This is yet again a statement that is true as it stands but not true in regards to the issue being discussed in context. The message that the essay is meant to convey here is that the 2006 change to the Book of Mormon introduction represented the mainstream LDS position “over the past century.” In the context of the essay as a whole, the point is that the change was not a response to the DNA problem. However, the facts are otherwise. As the evidence began to accumulate that this belief was untenable, the LDS Church hedged on the matter. Thus the 1981 introduction to the Book of Mormon stated that the Lamanites were “the principal ancestors of the American Indians.” This statement did not formally deny the traditional view, since of course many modern American Indians have some modern European ancestry, but it did give some room for Mormons to explore different views. The problem is that the interpretation of the Book of Mormon as an account of a small, genetically invisible subset of the people living in a small part of Mesoamerica accommodates the Book of Mormon to the scientific evidence at a heavy cost. This interpretation distorts the narrative of the book it seeks to defend and negates what Joseph Smith himself said about it. Moreover, it is highly doubtful that this interpretation succeeds in handling the scientific problems (see our companion article for more). No wonder that many Mormons have had their confidence in the Book of Mormon shaken by the recent advances in the scientific study of the origins and history of Native Americans. 1. Morgan W. Tanner, “Jaredites,” in Encyclopedia of Mormonism, edited by Daniel H. Ludlow (New York: Macmillan, 1992), 717 (717-20). The traditional date is ca. 2200 BC; see William J. Hamblin, “Book of Mormon Chronology,” in Book of Mormon Reference Companion, edited by Dennis L. Largey (Salt Lake City: Deseret, 2003), 196-204. John L. Sorenson, whose views on Book of Mormon history and geography now dominate LDS scholarship, in earlier study had proposed a date of 3114 BC but more recently suggested that the Jaredites reached the Americas around 2800 BC (while allowing that it might have been somewhat later); see Mormon’s Codex: An Ancient American Book, Neal A. Maxwell Institute for Religious Scholarship (Salt Lake City: Deseret, 2013), 27. LDS anthropologist Brant Gardner’s commentary presents a highly revisionist chronology that dates Jared to the 1100s BC and that rejects the connection between Jared and the Tower of Babel as an unhistorical retelling of the story by the first-century BC Nephite king Mosiah; see Brant A. Gardner, Second Witness: Analytical & Contextual Commentary on the Book of Mormon (Salt Lake City: Greg Kofford Books, 2007), 6:148, 150, 154. 2. These points are taken, with some editing, from Robert M. Bowman Jr., “The Sermon at the Temple in the Book of Mormon: A Critical Examination of Its Authenticity through a Comparison with the Sermon on the Mount in the Gospel ofMatthew,” Ph.D. diss. (South African Theological Seminary, 2014), 417-18. 3. Gardner, Second Witness, 1:352. 4. John L. Sorenson, “When Lehi’s Party Arrived in the Land, Did They Find Others There?” in Nephite Culture and Society: Selected Papers (Salt Lake City: New Sage Books, 1997), 65-104. This article was originally published in Journal of Book ofMormon Studies 1/1 (1992): 1-34. See also Matthew Roper, “Nephi’s Neighbors: Book of Mormon Peoples and Pre-Columbian Populations,” FARMS Review 15/2 (2003): 91-128; Blake T. Ostler, “DNA Strands in the Book of Mormon,” Sunstone 137 (May 2005): 63-71. 5. Sorenson, “When Lehi’s Party Arrived,” 71-73. 7. See Joel B. Groat, “Lamanites No More: DNA and Lost Ties to Father Lehi” (Institute for Religious Research, 2004), especially Part 1. 8. “Facts Are Stubborn Things,” Times and Seasons (Nauvoo, IL) 3/22 (15 Sept. 1842): 922. The quotation is shown as it appears in Times and Seasons (including the italicized lines), with corrections in brackets. The quotation comes from John Lloyd Stephens, Incidents of Travel in Central America, Chiapas, and Yucatan, Vol. 2 (New York: Harper & Brothers, 1841), 171-72. The appeal to the Times and Seasons quotation from Stephens derives from an article by LDS scholar Matthew Roper, who quotes part of it and concludes (following Hugh Nibley) that it proves that Joseph Smith was open to “other migrations than those mentioned in the Book of Mormon.” See Matthew Roper, “Nephi’s Neighbors: Book of Mormon Peoples and Pre-Columbian Populations,” FARMS Review 15/2 (2003): 99-100 (91-128). 9. Assuming for the sake of argument that one imagines the Toltec arriving in the Book of Mormon lands not long after the Exodus, they would have become assimilated into the Jaredite civilization and died with it in the war that the Book of Mormon indicates ended at Cumorah in the early sixth century BC. This means that they would not have been around to mix with the Lehites and Mulekites. Of course, no such thing happened. Historians date the Toltec culture (itself notoriously difficult to define) to the 10th through 12th centuries AD, well over two thousand years after Moses. See “Toltec Culture,” in Archaeology of Ancient Mexico and Central America: An Encyclopedia, edited by Susan Toby Evans and David L. Webster (New York: Routledge, 2010), 759-63. 10. John L. Sorenson, “The Book of Mormon as a Mesoamerican Record,” in Book of Mormon Authorship Revisited: The Evidence for Ancient Origins, edited by Noel B. Reynolds (Provo, UT: FARMS, 1997), 393-94 (391-521). 11. Thomas W. Murphy, “Lamanite Genesis, Genealogy, and Genetics,” in American Apocrypha: Essays on the Book of Mormon, edited by Dan Vogel and Brent L. Metcalfe (Salt Lake City: Signature Books, 2002), 47-77; “Simply Implausible: DNA and a Mesoamerican Setting for the Book of Mormon.” Dialogue 36/4 (Winter 2003): 109-131; Simon G.Southerton, Losing a Lost Tribe: Native Americans, DNA, and the Mormon Church (Salt Lake City: Signature Books, 2004). 12. Carrie A. Moore, “Debate Renewed with Change to Book of Mormon Introduction,” Deseret News, 8 Nov. 2007. 13. John-Charles Duffy, “Mapping Book of Mormon Historicity Debates: A Guide for the Overwhelmed—Part I,” Sunstone 151 (Oct. 2008): 42.